My windshield washer fluid stopped spraying one day. I assumed it was because the bit of summer stuff I had in there ended up freezing and wrecked something, but I wasnt sure. When I dropped my car off, the service employee said, and I quote, "Hopefully it is just the fuse, but we will check it out". I got a call about an hour later from him telling me that it was not fuse, the washer fluid pump was broken. I agreed to buy the part from you guys but wanted to save on labour by fixing it with help from family. I will not fully delve into the immense rudeness I experienced when paying my bill for labour (they started fixing it before my service rep called me to explain the problem and charges; in other words, without my authorization). Once we had my vehicle apart, we found that the washer pump, that RMP told me was broken and needed replacing, was working just fine. Suspiciously, we checked the fuse. Sure enough, it was clearly blown and after a quick replacement, my wipers worked perfectly fine. RMP blatantly lied to me about what was wrong with my vehicle. Either the service employees lied and didnt check the fuse at all or they knew that it was just the fuse but saw an opportunity to take advantage of me by getting me to pay for an expensive part and many hours of expensive labour for a 2-minute fuse replacement job and wouldnt have known the difference. Either way, it was disgraceful and crooked. Rightfully so, I eventually got my money back after being hung up on arguing with management about this experience. DO NOT get an inspection here. They are $95 for it. But then try to fix problems that dont exist! Tried saying my car needed $350 for rotors and got second opinion that said there is nothing wrong at all with them! Scammers. Should have known. GM service techs are all rained to rip people off no matter where you go. Avoid the service shop here. Cant speak for sales, which I was actually considering purchasing another truck here with. Not after this though. Told us we could bring our car in for an inspection. Couldn`t find out lug nut, so we had to go back and show them where in the trunck it was. Then we got a call a half hour before they closed saying they couldn`t get to our car. All we got was a sorry, and an upset two year old from being dragged back and forth. The "no car crap bs" is the best car buying experience IMO. 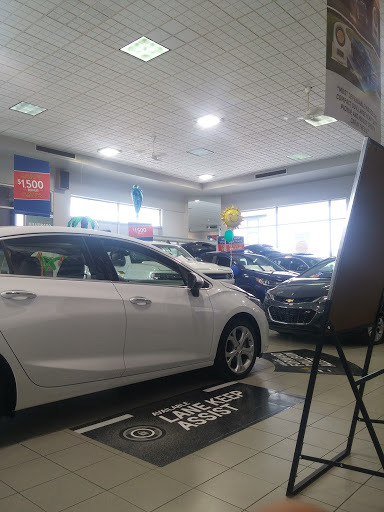 You can still get a great deal without all the phony "I got to go ask my boss" and without being tackled by salespeople the minute you walk in the door to look at a vehicle. It is something you have to experience to appreciate. Just want to say thanks to Roger and Chris for making the purchase of my 2018 Equinox not only stress free but also fun. Roger had excellent knowledge of the product he was selling and Chris was just a comfort to talk finance with. My third equinox from RMP and each time superior service. Every time I take my vehicle to the service department at RMP Aaron goes above and beyond to make sure the work done to my vehicle is perfect. I am pretty fussy about my car and its great to have someone like him that I can trust and count on. Id be lost without Aaron. Had my 02 Malibu serviced through RMP. Staff was very easy to deal with, they kept their lines of communication open throughout the process, and were fair and reasonable about what work needed to be done, and what they could do about it. An excellent experience. Thanks for the positive experience. Roger knows the product he is selling and did not pressure us at any time. He gave us time to make our decision and always made us feel comfortable. I am sure we will enjoy our vehicle for many years to come. Thanks again. Roger Silzer was very friendly and patient. Really made leasing our car a great experience. Would highly recommend him. Chris and Andrea were also fantastic when it came to the paper work and everything. Thank again! Sales is awesome! Kind and great to deal with. Service side is horrid, 10 min simple tire swap has taken over a hour and a half...should have taken the already mounted rim and tires and done it myself. Went in owing a lot for my 7 years pick up. They put me into a brand new Chevy with dame payments but owing less money in the long run. Awesome job. RMP has an outstandingly service department. Specifically Aaron. A professional and knowledgeable young man. Thank you Aaron for always giving 110%. Excellent experiences with Kevin, my first time buying the car with RMP for sure not going to be the last also. Excited waitting for my new ride. Charged $100.00 for an estimate for a $1000.00 repair that they couldnt guarantee would fix the problem. Needless to say that I didnt proceed. Best experience ever. Great selection, excellent staff and they almost make it too easy to get into a new vehicle. Really is "no hassle". Travis and Len are wonderful and they made the experience easy, and painless. They were extremely knowledgeable and helpful. Great friendly service, Im happy I bought my new car from them. Always had great treatment from the staff here!